Berastagi is a lovely tourist town in the Karo highlands on the way from Medan to Lake Toba. 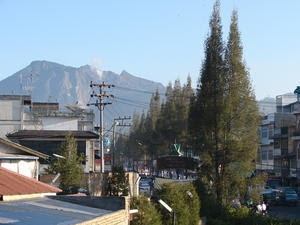 It is situated at an altitude of 1300m and with the setting of by two volcanoes, Mt.Sinabung and Mt.Sibayak. At Gundaling Hill you can see a clear view of those two volcanoes.